In London recently, I visited the Courtauld Institute at Somerset House. Everywhere, one's attention is split into small bits by so many wonderful things. But it was this self-portrait which hung by itself in a large wood-paneled room which so surprised me. I spent a long time with it and I think because it was alone I was able to completely plug into it. Often paintings hanging side by side in rooms can be a distracting affair. 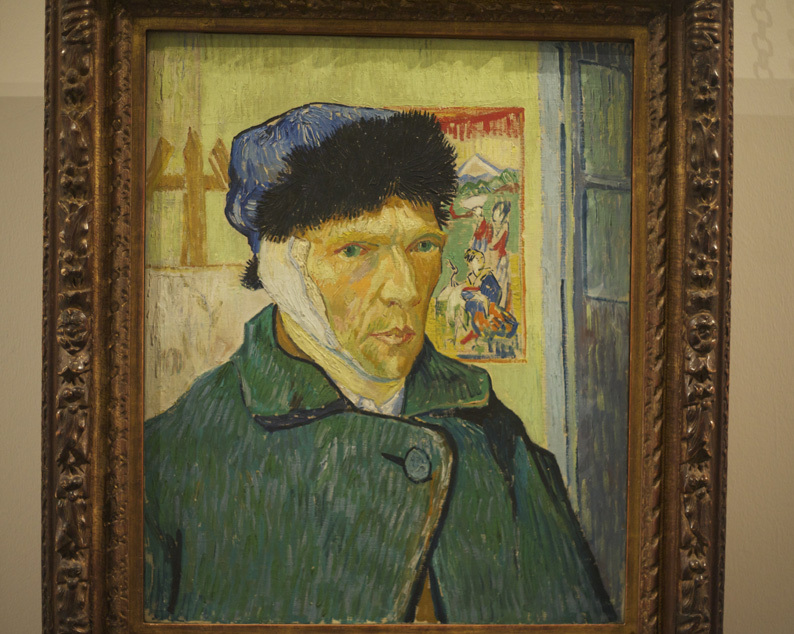 This amazing portrait must have been painted just days after Vincent cut off his ear. I know there is another version with a red background, also with a bandage, but its this one which I find mesmerizing. Firstly, I find it so beautifully done with its cool and disjunctive color harmonies prancing around lime yellow. Its a complex painting despite its apparent simplicity at first view. Its so flat, and distinctly drawn from an obsessive love for Japanese portraiture. The prussian blue hat (which also figures in the other portrait) with its almost black fringe acts like a kind of black hole around which everything seems to gravitate. Well,.. for me it is extraordinary, beautiful, and yes; perfect. Its a truthful portrait and one can only imagine what the ordinary, uninspired folk of the 19th century must have seen: Ugliness! It was Baudelaire who once said that often, new and original works of Art can look ugly on first viewing. How vigilant this forces us to be in our contemporary times. Ultimately what trapped me in front of it for an hour was its Humanity, the deep rich humility of the person which Vincent so apparently possessed. There isn't a hint of sentimentality anywhere, just a plea perhaps to God, that he might be understood. Thank you. Next best thing to being there.